"OSLO — The Nobel Committee announced Friday that the annual peace prize was awarded to Barack Obama, just nine months into his presidency, “for his extraordinary efforts to strengthen international diplomacy and cooperation between peoples.”"
Nine months into Bush's presidency the country was reeling from the attacks of September 11th. In his defense, President Bush said that he hadn't had time to get up to speed on everything, so the fact that the country was blindsided by the attacks wasn't his fault. 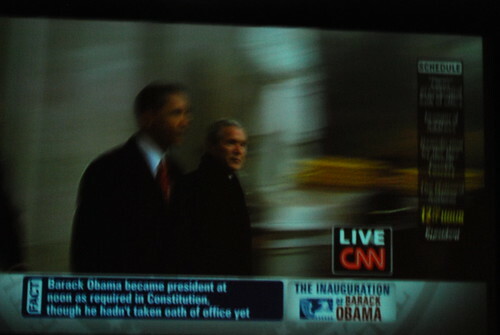 President Obama's inauguration, January 20, 2009. Photo by cdozo © 2009.